Both EDL and ERS share the same database structure and both applications can automatically create your SQL database for you with a couple clicks. 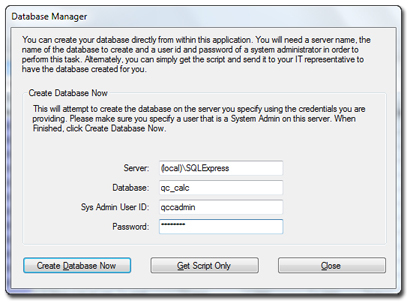 This greatly eases the rollout of the application and ensures the database will be set up correctly. To the right is the database creation wizard. All you need to do is fill out a couple of fields (with some help from your IT organization) and click the Create Database Now button. Since EDL and ERS share the database, changes that occur with future versions are built into the two applications. This way, both applications keep track of the database and both understand how to update it to the latest version. If either application detects the database is out of date, it immediately stops and asks you to update. You simply enter the password and click the button and it's updated. This keeps the system running smoothly and avoids unexpected errors.